Not to be confused with A Room with a View. A Room of One's Own is an extended essay by Virginia Woolf, first published in September 1929. The work is based on two lectures Woolf delivered in October 1928 at Newnham College and Girton College, women's constituent colleges at the University of Cambridge. An important feminist text, the essay is noted in its argument for both a literal and figurative space for women writers within a literary tradition dominated by men. The essay was based on two papers Woolf read on 20 and 26 October 1928 to two Cambridge student societies, the Newnham Arts Society at Newnham College and the ODTAA Society at Girton College, respectively. Elsie Duncan-Jones, then known as Elsie Phare, was the president of the Newnham Arts Society at the time and wrote an account of the paper, "Women and Fiction", for the college magazine, Thersites. Woolf stayed at Newnham at the invitation of Pernel Strachey, the college principal, whose family were key members of the Bloomsbury Group. At Girton she was accompanied by Vita Sackville-West. It was published in 1929 as a book with six chapters. In referencing the tale of a woman who rejected motherhood and lived outside marriage, a woman about to be hanged, the narrator identifies women writers such as herself as outsiders who exist in a potentially dangerous space. 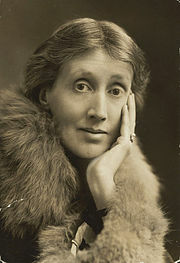 Woolf notes that women have been kept from writing because of the constraints they face and their relative poverty: "In the first place, to have a room of her own, let alone a quiet room or a sound-proof room, was out of the question, unless her parents were exceptionally rich or very noble, even up to the beginning of the nineteenth century." The essay examines whether women were capable of producing, and in fact free to produce, work of the quality of William Shakespeare, addressing the limitations that past and present women writers face. Women have burnt like beacons in all the works of all the poets from the beginning of time. Indeed if woman had no existence save in the fiction written by men, one would imagine her a person of the utmost importance; very various; heroic and mean; splendid and sordid; beautiful and hideous in the extreme; as great as a man, some would say greater. But this is woman in fiction. In fact, as Professor Trevelyan points out, she was locked up, beaten and flung about the room. A very queer, composite being thus emerges. Imaginatively she is of the highest importance; practically she is completely insignificant. She pervades poetry from cover to cover; she is all but absent from history. She dominates the lives of kings and conquerors in fiction; in fact she was the slave of any boy whose parents forced a ring upon her finger. Some of the most inspired words and profound thoughts in literature fall from her lips; in real life she could hardly read; scarcely spell; and was the property of her husband. This section is about a fictional character. For the real-life individual, see Judith Quiney. In one section Woolf invents a fictional character, Judith, Shakespeare's sister, to illustrate that a woman with Shakespeare's gifts would have been denied the opportunity to develop them. Like Woolf, who stayed at home while her brothers went off to school, Judith is trapped in the home: "She was as adventurous, as imaginative, as agog to see the world as he was. But she was not sent to school." While William learns, Judith is chastised by her parents should she happen to pick up a book, as she is inevitably abandoning some household chore to which she could be attending. Judith is betrothed, and when she does not want to marry, her father beats her, then shames her into the marriage. While William establishes himself, Judith is trapped by what is expected of women. She runs away from home to London, is harassed and laughed at when she tries to become an actor, and is finally made pregnant by an actor-manager who said he would help her. She kills herself and "lies buried at some cross-roads where the omnibuses now stop outside the Elephant and Castle". William lives on and establishes his legacy. In the essay, Woolf constructs a critical and historical account of women writers thus far. Woolf examines the careers of several female authors, including Aphra Behn, Jane Austen, the Brontë sisters, Anne Finch, Countess of Winchilsea, and George Eliot. In addition to female authors, Woolf also discusses and draws inspiration from noted scholar and feminist Jane Ellen Harrison. Harrison is presented in the essay only by her initials separated by long dashes, and Woolf first introduces Harrison as "the famous scholar, could it be J---- H---- herself?" Woolf also discusses Rebecca West, questioning Desmond MacCarthy's (referred to as "Z") uncompromising dismissal of West as an "'arrant feminist'". Among the men attacked for their views on women, F. E. Smith, 1st Earl of Birkenhead (referred to as "Lord Birkenhead") is mentioned, although Woolf further rebukes his ideas in stating she will not "trouble to copy out Lord Birkenhead's opinion upon the writing of women". Birkenhead was an opponent of suffrage. The essay quotes Oscar Browning, through the words of his (possibly inaccurate) biographer H. E. Wortham, "that the impression left on his mind, after looking over any set of examination papers, was that, irrespective of the marks he might give, the best woman was intellectually the inferior of the worst man". In addition to these mentions, Woolf subtly refers to several of the most prominent intellectuals of the time; her hybrid name for the University of Oxford and the University of Cambridge—Oxbridge—has become a well-known term, although she was not the first to use it. Vita Sackville-West accompanied Woolf to the Girton lecture. Woolf wrote in her diary before A Room of One's Own was published that she thought when it was published she would be "attacked for a feminist & hinted at for a sapphist" [sapphist means lesbian]. In one section of the book, describing the work of a fictional woman writer, Mary Carmichael, Woolf deliberately invokes lesbianism: "Then may I tell you that the very next words I read were these – 'Chloe liked Olivia ...' Do not start. Do not blush. Let us admit in the privacy of our own society that these things sometimes happen. Sometimes women do like women." Woolf references the obscenity trial and public uproar resulting from the publishing of Radclyffe Hall's lesbian-themed novel The Well of Loneliness (1928). Before she can discuss Chloe liking Olivia, the narrator has to be assured that Sir Chartres Biron, the magistrate of Hall's obscenity trial, is not in the audience: "Are there no men present? Do you promise the figure of Sir Chartres Biron is not concealed? We are all women, you assure me? Then I may tell you ..."
Woolf scholar and feminist critic Jane Marcus believes Woolf was giving Radclyffe Hall and other writers a demonstration of how to discuss lesbianism discreetly enough to avoid obscenity trials; "Woolf was offering her besieged fellow writer a lesson in how to give a lesbian talk and write a lesbian work and get away with it." Marcus describes the atmosphere of Woolf's arrival and presence at the women's college with her lover Vita Sackville-West as "sapphic". Woolf is comfortable discussing lesbianism in her talks with the women students because she feels a women's college is a safe and essential place for such discussions. Virginia Woolf, in her book A Room of One's Own, wrote that in order for a woman to write fiction she must have two things, certainly: a room of her own (with key and lock) and enough money to support herself. What then are we to make of Phillis Wheatley, a slave, who owned not even herself? This sickly, frail, Black girl who required a servant of her own at times—her health was so precarious—and who, had she been white, would have been easily considered the intellectual superior of all the women and most of the men in the society of her day. Walker recognises that Wheatley is in a position far different from the narrator of Woolf's essay, in that she does not own herself, much less "a room of her own". Wheatley and other women writers exist outside of this room, outside of this space Woolf sets asides for women writers. Although she calls attention to the limits of Woolf's essay, Walker, in uniting womanist prose (women's writing) with the physical and metaphorical space of "our mothers' gardens", pays homage to Woolf's similar endeavour of seeking space, "room", for women writers. The essay was adapted as a play by Patrick Garland, who also directed Eileen Atkins in its stage performance. A television adaptation directed by Garland was broadcast on PBS Masterpiece Theatre in 1991. There is a feminist bookstore in Madison, Wisconsin, named A Room of One's Own, and a Canadian literary journal, Room of One's Own, now Room, showcasing the work of women writers and visual artists. The Smiths' song "Shakespeare's Sister" is named after a section of the essay. Shakespears Sister is an alternative pop group featuring Siobhan Fahey. The Two Nice Girls' third album, from 1991, was called Chloe Liked Olivia. Chloe plus Olivia: an anthology of lesbian literature from the seventeenth century to the present, was published in 1994 by Lillian Faderman. The women's co-working space in Singapore, "Woolf Works", was named after Virginia Woolf as a response to this essay. Patricia Lamkin's play Balancing the Moon (2011) was inspired by the essay. ^ "Yestreen the Queen had four Maries / This nicht she'll hae but three, O / There was Mary Beaton, and Mary Seaton / And Mary Carmichael, and me, O." ^ Woolf, Virginia (1935) . A Room of One's Own. London: Hogarth Press. p. 4. For a different date, see "FAQ: A Room of One's Own Publication History". Virginia Woolf Seminar. University of Alabama in Huntsville. 20 January 1998. p. 1. Archived from the original on 24 December 2012. ^ a b Woolf 1935, p. 5. ^ a b Rosenbaum, S. P. (1998). Aspects of Bloomsbury: Studies in Modern English Literary and Intellectual History. Hounsmill: MacMillan Press Ltd. pp. 113–115. ^ Tullberg, Rita McWilliams (2004). "Strachey, (Joan) Pernel (1876–1951)". Oxford Dictionary of National Biography. ^ "A Room of One's Own", British Library. ^ Woolf 1935, p. 8. ^ Bronson, Bertrand (ed.) (2015). The Singing Tradition of Child's Popular Ballads (Abridgement). Princeton: Princeton University Press, p. 321. ^ Woolf 1935, p. 79. ^ Woolf 1935, pp. 64–66. ^ Woolf 1935, p. 71. ^ Woolf 1935, pp. 71–73. ^ a b Woolf 1935, p. 26. ^ Woolf 1935, p. 80. ^ "The Friendship Between Churchill and F. E. Smith". The Churchill Center and Museum. Archived from the original on 31 July 2013. ^ Moad, Rosalind (21 March 2003). "A list of The Papers of Oscar Browning, held by King's College Archive Centre, Cambridge". The Archives Hub. Archived from the original on 23 December 2012. ^ Woolf 1935, pp. 80–81. ^ Eileen Barrett; Patricia Cramer (July 1997). Virginia Woolf: Lesbian Readings. NYU Press. pp. 218–. ISBN 978-0-8147-1263-4. ^ Robin Majumdar; Allen McLaurin (1 September 2003). Virginia Woolf. Routledge. pp. 22–. ISBN 978-1-134-72404-8. ^ a b Woolf 1935, p. 123. ^ Cramer, Patricia (2005). "Jane Harrison and Lesbian Plots: The Absent Lover in Virginia Woolf's The Waves". Studies in the Novel. JSTOR 29533720. ^ Marcus, Jane (1996). Virginia Woolf, Cambridge and A Room of One's Own: 'The Proper Upkeep of Names'. London: Cecil Woolf Publishers, p. 33. ^ Walker, Alice (2004). In Search of Our Mothers' Gardens: Womanist Prose. New York: Harcourt Brace Jovanovich. p. 235. ISBN 9780156028646. ^ Lamkin, Patricia (28 October 2011). "The Phases of Balancing the Moon". @This Stage. A Room of One's Own on IMDb (1991, with Eileen Atkins). Longworth, Deborah (1 March 2017). "Virginia Woolf and Feminist Aesthetics", lecture on A Room of One's Own, University of Birmingham. This page was last edited on 14 January 2019, at 20:21 (UTC).